Usually, at auto shows you will find abstract concepts of electric cars that are so far fetched, nobody takes them seriously. 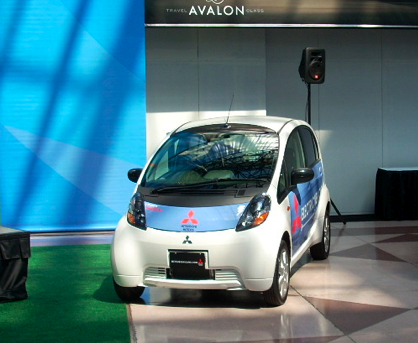 This year at the New York Auto Show, companies like Mitsubishi, Mini, Think, and Amp Motorworks are changing the regular programming by providing press and public test drives of highway capable electric vehicles. 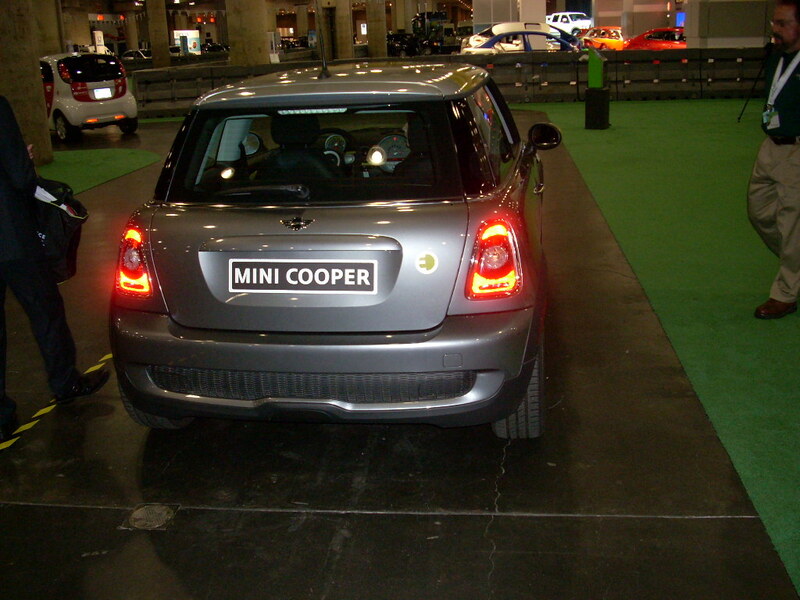 In the 2010 auto show, electric cars like the Mini E and the i-MiEV are already on the road, leased to select test markets and certain fleet and government patrons. 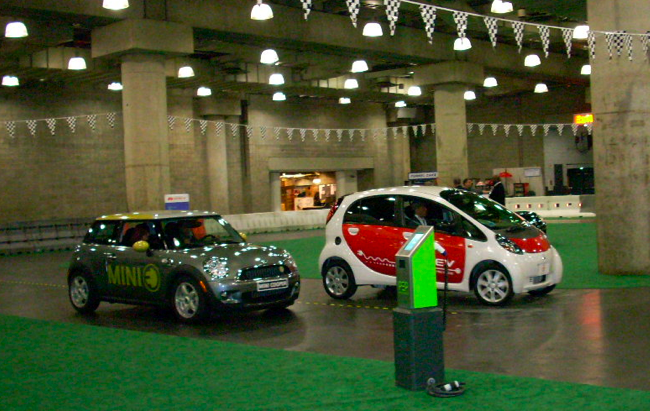 The electric vehicle test drive track is in the EV Pavilion at the back of the bottom floor, but it will surely be a crowd pleaser when the auto show opens up to the public April 2-11. When I arrived, only 2 electric vehicles, the Mitsubishi i-MiEV and the Mini E, were circling the winding track. I had to “sign my life away” on some contract that relieved them of any responsibility for any bodily harm I might inflict on myself while I played Dukes of Hazard with the EVs. They also made me swear not to go take it over 15 mph. It was an indoor go kart track, after all. Then I was ready to drive some electric powered machines. 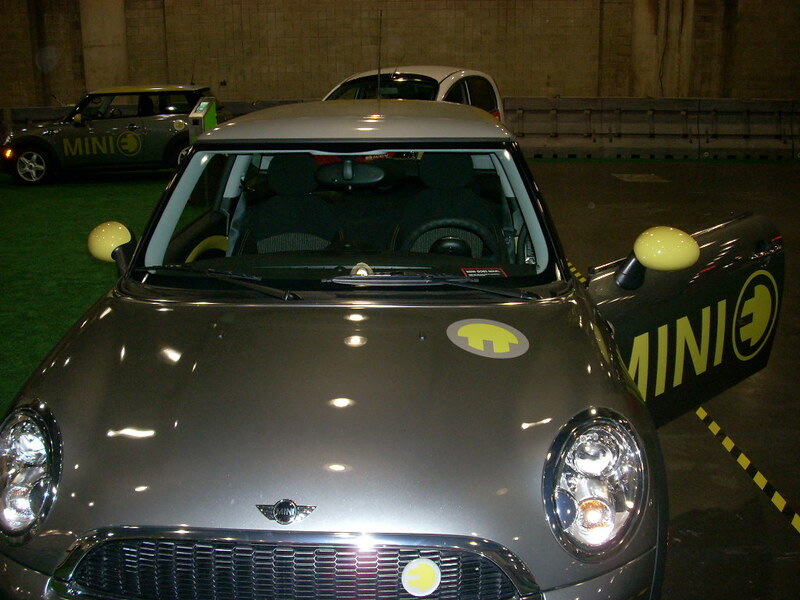 First up was the Mini E. This mighty mouse has a good amount of power, 200 HP, and that is with a 100% torque electric motor, so it really picks up. With an electronically regulated top speed of 95 mph, and a 150 mile range (told 100 by the spokeswoman, oddly, perhaps realistically), this car can get you anywhere you need to go, fast. This is about neck high, right behind the drivers seat. It is the battery pack. Not only is this a two-seater, but it is a two-seater with the storage space of a Vespa. I contemplated the Mini E’s practicality watching press groups load up the 5-passenger i MiEV. 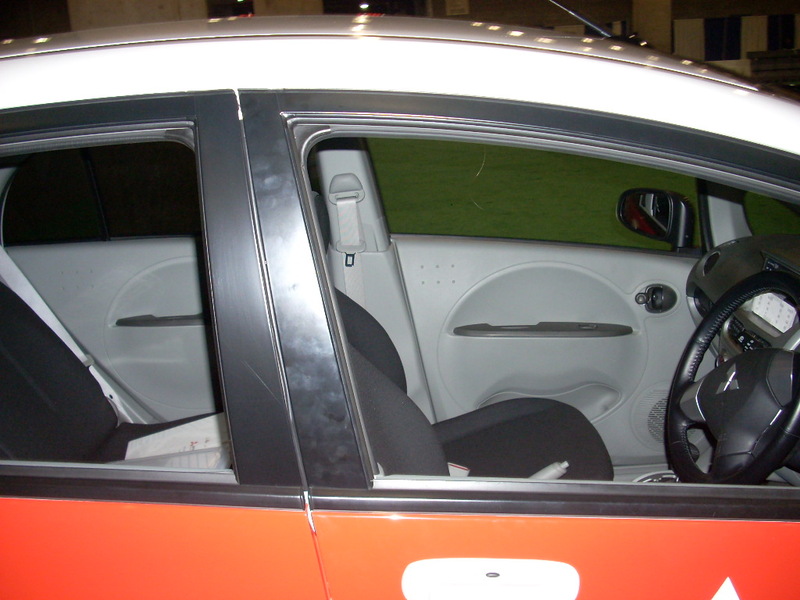 I took the car out of park, following the instructions of the Mini spokeswoman in the passenger seat. No lurch. The car does not lurch forward in drive like your typical ICE vehicle. Once you get moving, drives much like a car in first gear all the time, meaning it is very torque-ee. You accelerate, let off the gas (electricity) and you rapidly decelerate because of the strong regenerative braking. I had heard about this being an issue with the Mini E, so it was pretty much what I expected. It makes me wonder if the big sacrifice in momentum is worth the electricity regained. Anyway the car accelerated great on the miniature straightaway. I would love to see what the Mini E could do on an interstate on-ramp instead of an indoor track. Honestly, I am still uncomfortable pronouncing this one aloud (i Meeve or i Me-ehv). Yes, this is a fully equipped, four door family EV. The cabin was so spacious, I could not believe they fit a lithium ion battery in there, which is hidden flat under the car. This will not compete with the Mini E on the track though. It will get you 0-60 in 13 seconds, has a top speed of 80 mph, and has a 100 mile range. 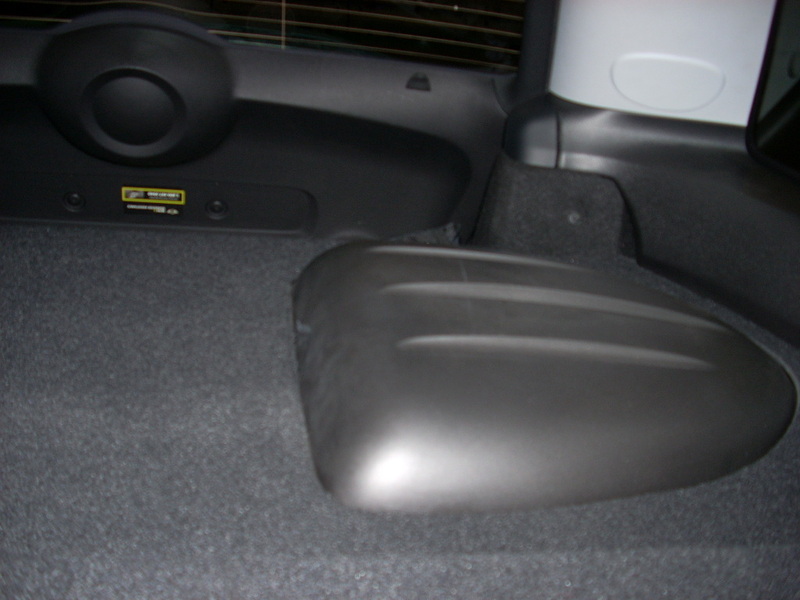 But I could not even fit my backpack into the Mini E with another person in the car. I could get married, have a couple kids, and take them all to soccer practice in the i-MiEV. The i-MiEV makes such good use of the space it has, and is just smartly designed for what it is, a family commuter vehicle. 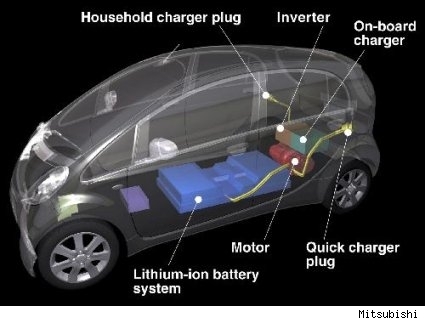 Not only is the i MiEV more spacious, but it rides more comfortably too. The car creeps forward in drive like a traditional vehicle, and the regenerative braking is much more natural. The car kind of coasts when you lift off of the accelerator. The interior space and user friendly drive make the i-MiEV the winner in this EV showdown.